HomeKODI5 Best Methods To Mirror Android Screen to Your PC (No Root Required)? Android screen mirroring has gone underrated for quite an extended period. It is because either not many people are aware of it or they just don’t want to deal with the hassle. Now, there are hundreds of screen mirroring apps through which you can display Android on your PC. Screen Mirroring is a way through which you can remotely share/mirror one device screen to another, such as mirroring Android Screen on your PC or vice-versa. At present, we’ll be talking about screen mirroring on Android. A phone screen on PC can help you in many ways. 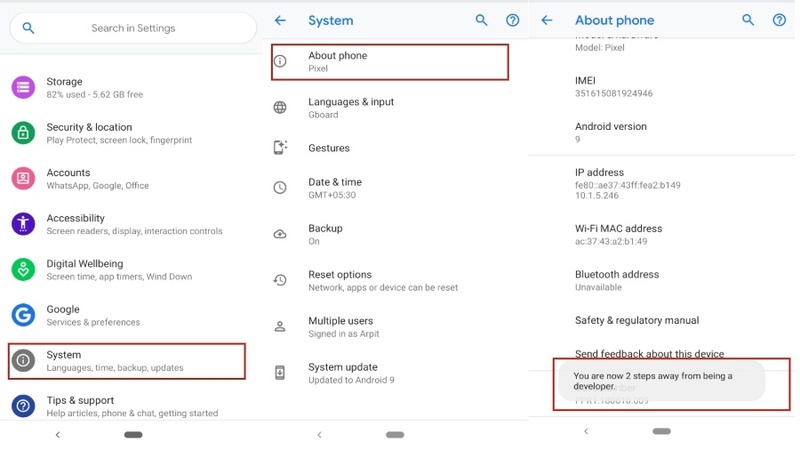 For instance, it removes that extra step of grabbing device for every new notification; If you are a developer, you can check app performance on the Android phone mockup; Sharing media files to PC also becomes very easy. 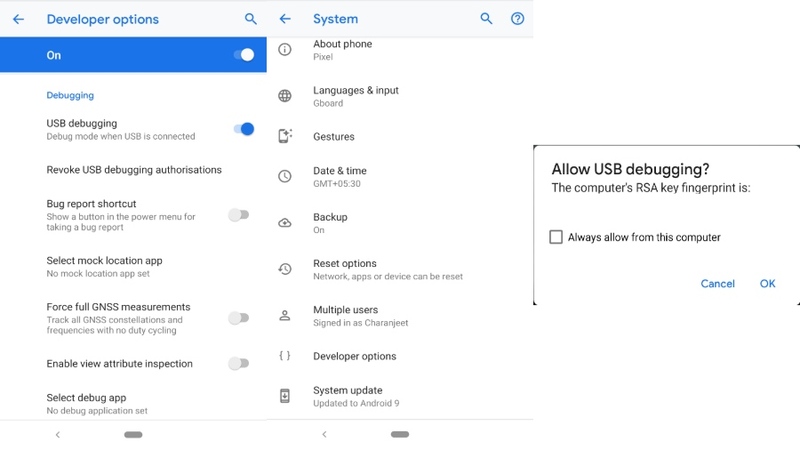 For screen mirroring apps to work, it is necessary that you turn on USB debugging which is located in the developer options of your Android device. Also, I would recommend you to tick “always allow” for the “Allow USB Debugging” pop-up. Thus, you won’t have to repeatedly deal with the permission box. The quickest method to view Android screen on your PC is via Vysor. The mirror app is ridiculously easy to set-up. You can use apps, play games, take screenshots and much more. The only drawback with Vyson is most of its necessary features comes with a price. From high resolution mirroring to share Android screen wirelessly, everything needs a subscription. Even the drag and drop is locked in the free version. Now, tap on view to start casting your device on your PC screen. Vyser in-app purchases – $2.50/monthly, $10/yearly, or $40/lifetime. 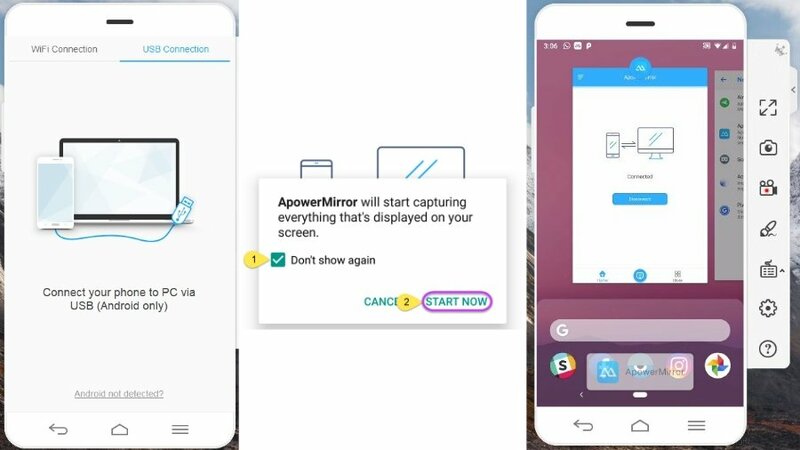 ApowerMirror is another brilliant application that lets your mirror Android to PC and vice-versa. 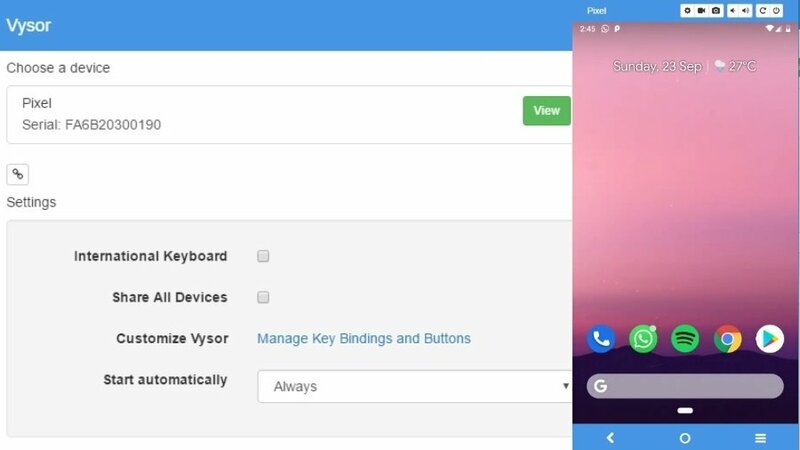 Apart from Android screen mirroring, the software even lets you take screenshots, record screen and control your Android device manually. Upon subscribing for the ApowerMirror VIP account, you can mirror three Android devices at the same time. The paid membership also allows you to scribble and draw on the screen. Download and Install ApowerMirror on your Windows and Android device. AirDroid is literally perfect in every way. No wonder the whole Android community recommends it. Apart from screen mirroring for Android, the software also lets users share files. 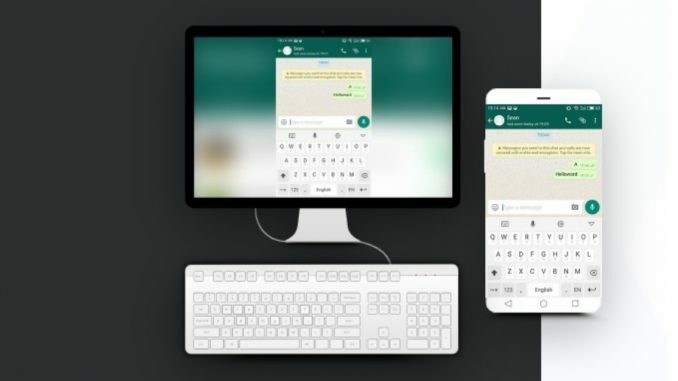 The mirroring application also comes with a desktop client so that you never miss any call or message notification. File Transfer feature lets you share files between PC and Android. On the other hand, AirDroid web enables you to use your phone on the web. In the pro account, you can remotely open the camera on your device. AirDroid screen mirroring app is quite different from other apps here. 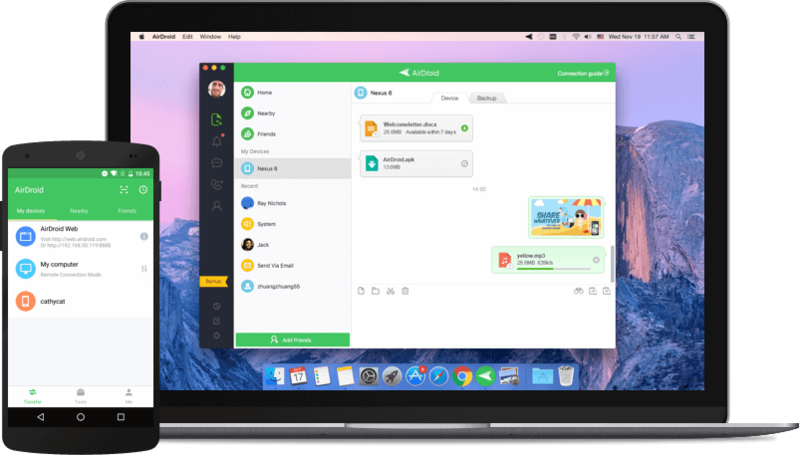 AirDroid has its own UI which include call logs, messages, pictures, files etc. This means you cannot play games, run apps or do things along those lines. However, the mirroring app lets you stream Android device to PC so that you can take screenshots and record the screen. Now, you can access your Android device files, calls, messages. The floating bar will show any notifications that come up on your device. 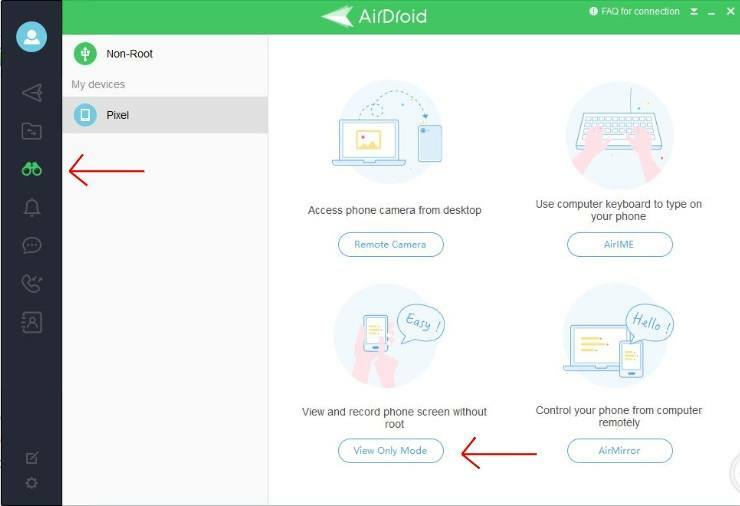 For receiving desktop notifications – Go to Android settings ⇒ Apps and Notifications ⇒ Special app access ⇒ Notification Acess ⇒Toggle AirDroid on. Head over to your Android device and tap “Start Now” on the pop-up. As the name suggests, the Android screen mirroring app is predominantly used for streaming your Android device. However, this screen sharing app has an endless number of platforms support. Starting with media players like VLC, KODI, OBS to sharing screen over the web. 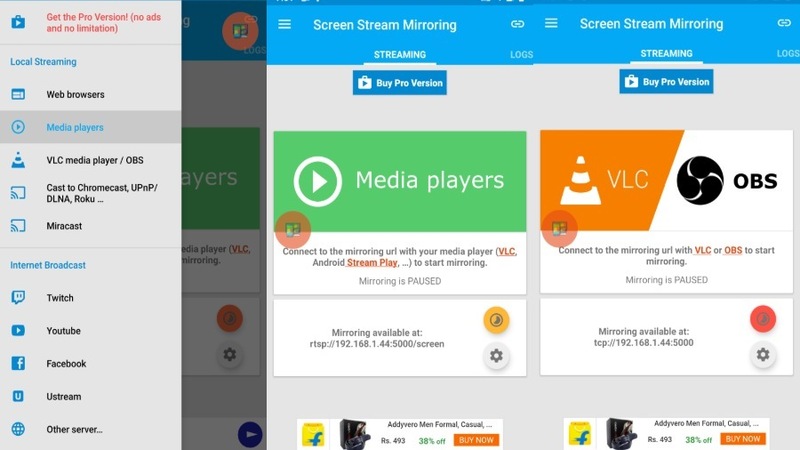 The mirroring app even allows you to broadcast your Android screen to Twitch, Youtube, Facebook, Ustream, etc. With this software, you can also share the screen with UPnP / DLNA device like Smart TV. Not to mention, the app is Google Chromecast ready as well. The only issue with this app is free version has a time limit for each application run, and the Android application is crawling with ads. 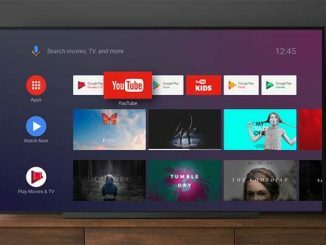 If you are looking to cast your Android device on a PC or TV, this Android app is surely a must. However, if controlling Android via PC is the primary goal, this app shouldn’t be on your list. Check out there official website FAQ to know more about how you can stream Android on different platforms. Mobizen is very similar to Vysor screen mirroring app for Android; only it’s much better. The best thing about Mobizen is that the basic features are free to use. They include mirroring form a web browser like Chrome, controlling device via keyboard/mouse, transferring and viewing files on PC and so much more. Apart from that, mirroring on Mobizen shows a sophisticated Android device render on the PC. You can set up screen transparency (ghost mode) and even add push notifications on a paid subscription. You can use your Android device remotely through the Mobizen website. While everything with this app is close to perfect, there is a slight problem with it. 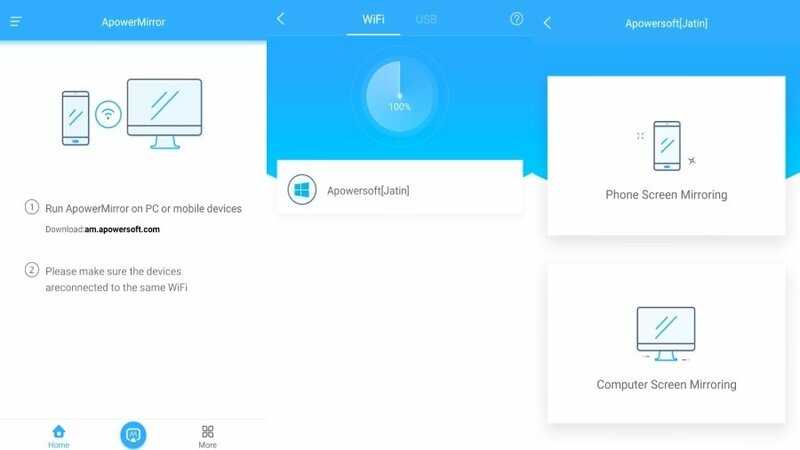 In the wireless option, the app doesn’t let you control your Android device. But you can still record, draw, transfer files and do lots of stuff. Also, when it comes to overall casting speed and smoothness, Vysor overcomes Mobizen entirely. 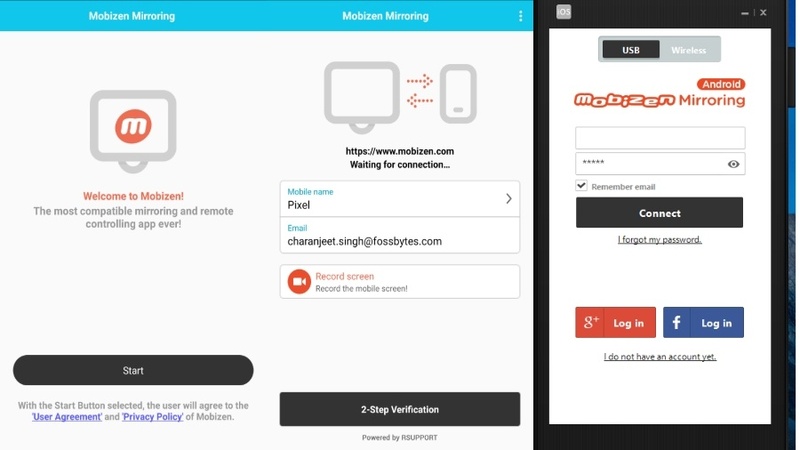 Download and install Mobizen mirroring app on your PC and Android Device. Open the Android app and sign in. To mirror the Android screen on a web browser. Just log in through this Mobizen website and follow the same steps above. Keep in mind that all these Android screen mirroring apps need a strong Internet connection. 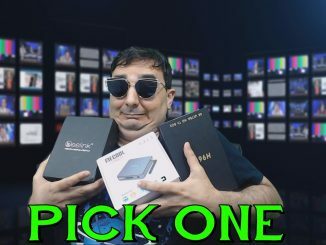 Also, both the platforms should be on a single Wifi to cast Android wirelessly. 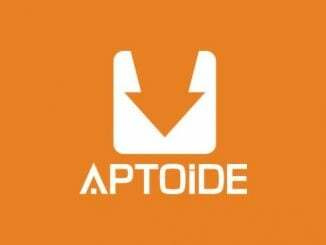 While all of these apps are good if you want to integrate your device functionality in the PC. 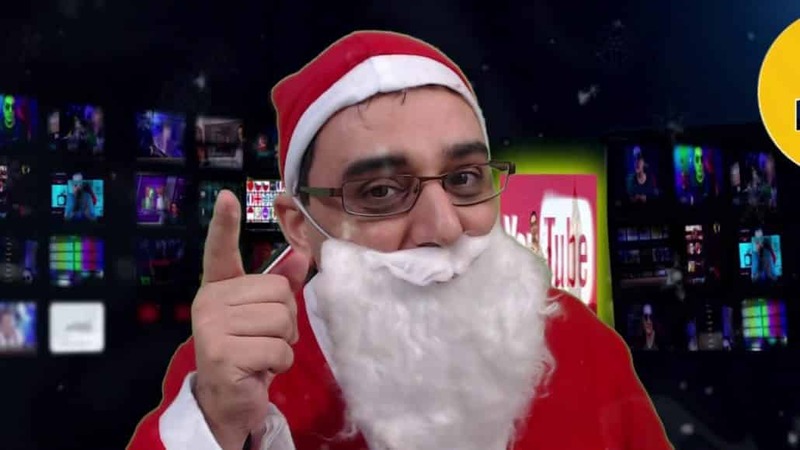 However, if you’re more into playing Android games on PC or using Android apps, I would recommend you to install one of the best Android Emulators to get uninterrupted Android experience on a computer.